Summary: Mobile geolocation is now being used in the financial industry. But, according to Cornerstone Advisors, banks need to do it right to keep customers happy. The next time you get into a tall building and punch the elevator button to ascend into the sky, consider how long it takes to get to the 8th floor. 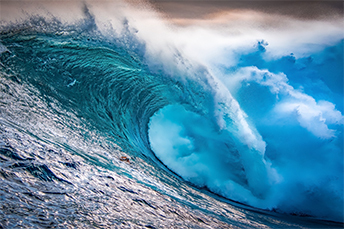 We say this not because that floor is anything special, but rather because researchers have just recorded the biggest ocean wave ever to hit the Southern Hemisphere off the coast of New Zealand. That whopper was 78 feet tall or just over 8 stories high! No matter how your bank tracks significant things, you may find it interesting to know that an Accenture survey found 63% of consumers are willing to share data to receive relevant product and service options from their bank. This includes location-based data from their cell phones. There are multiple ways to use such data, but banks have to do their homework here to keep customers happy, as was confirmed by a report from Cornerstone Advisors. Take a car dealership pitch as an example: if a customer gets pinged with auto loan offers every time they're just getting an oil change, the texts are falling on deaf ears and customers will get irritated. The key is to combine geolocation data with behavioral analytics - how often people go to certain places, how long they stay there and where they go from there. The answers to these questions can help banks paint a more complete picture of customers, such as whether they spend more time and money at upscale retailers vs. discount stores, or whether they work in an area close to the bank. Not only can the use of mobile location data improve customer segmentation around shopping behaviors and better track the effectiveness of marketing campaigns, but it can also provide some "competitive intelligence" and branch-specific activity to help banks improve performance. For instance, let's say a bank discovers a customer regularly spends a fair amount of time at another bank's branch. The institution can then research whether the competitor has more convenient locations, or is offering more enhanced technologies to improve service. Banks can also use mobile location data to determine how long certain customers stay at branches and then take a deeper dive. Is it a sign of a good interactions-to-transactions ratio or a sign of long wait times? Moreover, if certain days and times attract customers who prefer a lot face-to-face interaction, banks can then staff more branch employees who excel at turning such conversations into cross-selling opportunities. As most community banks don't have data scientists, it may be worthwhile to at least think differently. Start to think about what mobile location data sources are available, how to integrate them into existing data warehouses, and how to analyze the information to better serve customers in ways they like. If done well, the use of mobile location data can greatly enhance customer relationships and bring in more business. However, as with any new projects, make sure you do your homework first to ensure it is right for your bank. If this geolocation thing is not up your alley, at least we hope we have provided you with a good understanding of this practice, so you can put it on the agenda for strategic planning later on this year perhaps. As seen in the introduction, when you track things continually, you never know what may rise from the surface. Community banks should check spillover risk exposure to Sears and retail malls, as the company said it will close 72 more unprofitable stores. JPMorgan projects the Fed will raise rates at the June meeting and again in Sep and Dec given such strong economic conditions. Bank of America CEO Moynihan has seen a surge in commercial clients opening new loans and tapping into credit lines as they seek to expand following the federal tax cut at the end of 2017. Moynihan said average business loans increased by approximately 5.5% over last year. At a recent event, Microsoft advised businesses to invest more in cyberattack detection than in cyber risk education. They said cyber criminals are often part of large networks and have more resources than companies. UBS projects companies with high levels of cash will shift $2.5T into stock buybacks, dividends and M&A in 2018. Estimates show companies have $2.5T in cash sitting in the US and another $3.5T in overseas accounts. So far this year, sectors doing the biggest stock buybacks are: technology (60%), health care (16%), staples (10%), discretionary (6%), industrials (3%), energy (2%), financials (2%) and materials (1%).